By the time she was 10, Ebony Townsend had been bullied at school and on the bus for years, handcuffed and taken away from school in the back of a police car when she cried out for help, and suspended from the bus for 45 days. Profoundly deaf in one ear and painfully shy, Ebony also had learning disabilities in reading and math. None of her disabilities had ever been addressed by her Daytona Beach school, despite her father’s best efforts. In fact, she hadn’t even been properly assessed. “I had been everywhere trying to get help,” said Ebony’s father, Anthony Giddens, a single dad who works as a dishwasher and prep cook at Cracker Barrel. Giddens, who arranges his hours so that he can be home when Ebony gets off the bus, had attended parent-teacher conferences, pleaded with the principal for help, and eventually taken his concerns all the way to the school superintendent. He had once gone to court to get a restraining order on a 9-year-old boy who wouldn’t leave Ebony alone. And he’d tried to get private attorneys to represent Ebony, to no avail. “I took her out of one school, put her at another school, took her off of one bus, put her on another bus. I tried everything possible that a parent could do. I had no help at all. It was very, very stressful,” said Giddens, adding that it wasn’t out of the ordinary for him to receive multiple calls from his daughter’s school in a single morning while at work. 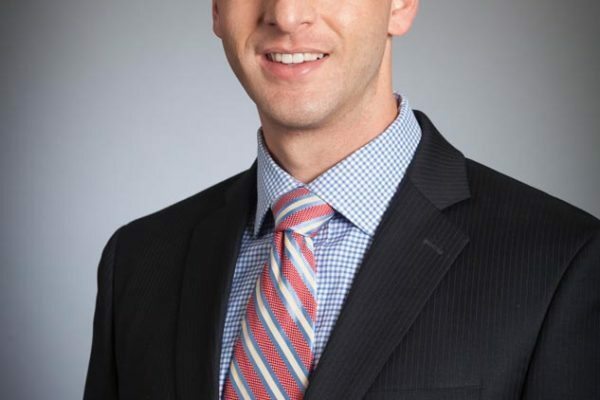 Then one day, as he was driving down Orange Avenue in Daytona, he found he was right in front of Community Legal Services of Mid-Florida, and he remembered the civil legal aid organization had once helped his mother with a legal issue she’d had. “It was like a sign from God saying, ‘You’ve been everywhere, but you haven’t been there,’ ” Giddens said. He parked, went inside, and told Ebony’s story to the intake coordinator. Within 15 minutes of leaving the legal aid office, he got a phone call. Katie Kelly, supervising attorney for the Children’s Rights Unit, would take Ebony’s case. Kelly’s work is funded by a $99,000 Florida Bar Foundation Children’s Legal Services grant. 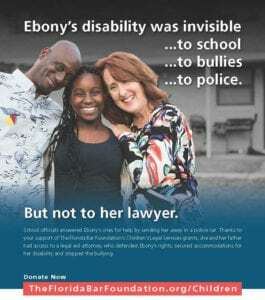 She is one of the only attorneys in Central Florida who handles cases like Ebony’s, and hers is one of 14 varied Children’s Legal Services projects statewide that the Foundation supports with nearly $1 million in funding. Kelly’s project specifically seeks to put a stop to a pattern in which students as young as Ebony, and sometimes even younger, are handed off to law enforcement instead of being provided accommodations or individualized instruction in accordance with the federal Individuals with Disabilities Education Act. “It was a textbook case of the school-to-prison pipeline, where kids who struggle ̶ especially kids who are poor, black or disabled ̶ are not given these services, and they end up in this pattern of exclusion, and expulsion through suspension. And when those exclusions don’t work, then oftentimes it rises to the level of kids being Baker Acted, which is an involuntary psychiatric hold, and arrested,” Kelly said. Giddens contacted Kelly after the school had police officers take Ebony for a psychiatric evaluation at Halifax Health Child & Adolescent Behavioral Services, where staff did not admit her under the Baker Act. Giddens also recalls the professionals at Halifax drawing that conclusion. Years before, when Ebony was in preschool and kindergarten, school audiologists had reported that she was deaf in one ear, but the school had never provided appropriate accommodations. Her teachers should have been using a lavalier microphone, checking to ensure she heard instructions, providing written instructions, and having her sit at the front of the class with her deaf ear by the wall. But they hadn’t been. Also, even though Ebony had been failing in school, she had been administratively promoted to the next grade and had never been assessed to determine why she was having difficulty learning. Kelly saw to it that Ebony was evaluated through the school and that she had an independent evaluation at UF Health Shands Hospital in Gainesville, Florida. Those evaluations uncovered her learning disabilities. Armed with this new evidence, Kelly worked with the school to develop an Individual Education Program (IEP) for Ebony to ensure she would receive the right kind of educational support. She also got her moved to another public school, where Ebony has blossomed. “I remember getting her report card: three F’s, a D, and all of a sudden she goes to a new school: six A’s, one B,” Giddens said. Ebony, now 12 and active in Girl Scouts, recently earned the chance to go to Victory Lane at the Daytona International Speedway with the Boys and Girls Club to celebrate making the A-B Honor Roll. Meanwhile, Ebony has had no behavioral problems at her new school and is not being bullied anymore. Ebony said she was confused as to why she was getting into trouble before. Giddens, who broke down in tears the first time he met with Kelly, said he never understood why he couldn’t get anywhere with the school on his own. “It’s crazy, because you would think that when you’re a parent, and you’re involved with your child, that’s what the school wants. I’m that parent, yes, I’m going to advocate, I’m going to be in your life, I’m going to stay on you. School is very important to me,” he said, adding that he’s grateful to Kelly, and to The Florida Bar Foundation for supporting Kelly’s work. Kelly has a simple explanation for why Giddens could make no headway. As gratifying as it is to see children like Ebony succeeding, Kelly does more than help one child at a time. She is advocating for multiple children through complaints to the U.S. Department of Justice and the U.S. Department of Education Office for Civil Rights, and she provides advocacy training to groups like the Guardian ad Litem program, the Florida Department of Children and Families and the Children’s Home Society. 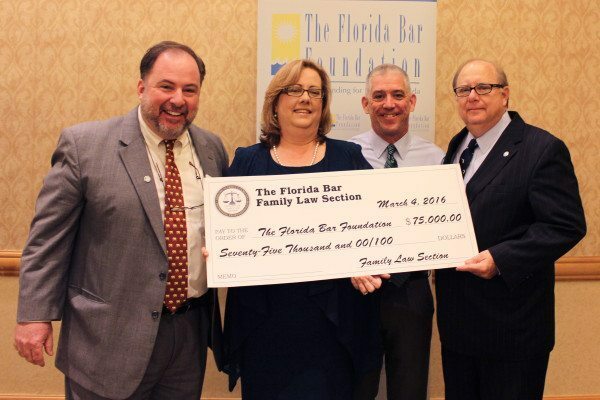 This year, The Florida Bar Foundation is not only supporting Kelly’s salary through its Children’s Legal Services grant, but it also has funded Equal Justice Works Fellow Anne Kanzow for two years starting in September to help expand Community Legal Services of Mid-Florida’s education advocacy project. She will be serving children with disabilities to rural areas in Hernando, Citrus, Lake, Marion and Putnam counties. Without Kanzow, Kelly and her fellow children’s rights attorney Valerie Dominique-Blocker would not be able to cover all 12 counties of the organization’s service area. Lawyers can support The Florida Bar Foundation’s Children’s Legal Services grants through voluntary contributions added onto their Florida Bar fee statement, and anyone can contribute to at www.TheFloridaBarFoundation.org/Children.